If you lead an ICT team, the good news is that you don't have to do it all yourself! Here are 10 ideas which I have found to be very helpful in creating a collaborative and co-operative team ethos. Leaders and managers don't change people: people change themselves. All that an effective leader or manager can do is get the right conditions in place for effective change (for the better) to happen. In political terms, it's the difference between power and authority. Power is where, when someone says "X will happen", people say "We must do X"; authority is where, when someone says "X will happen", people say "X ought to happen". Having authority is better than having power in the long run. I am firmly of the belief that an ed tech leader is only as good as the team they're leading, and that good in-service training plays a large part in improving teachers' skills, knowledge and understanding. A task a day for 31 daysLet's take that phrase 'good in-service training': what does 'good' mean? What is 'in-service training'? I think in-service training is good if it enables the teacher to do something s/he couldn't do before, or to be able to do it better. I'm using the word 'do' in a very broad sense. It could be that, having attended a course, you have a greater understanding of a particular issue than you did before, without necessarily having to actually do anything with your new-found knowledge. Ideally, in-service training should be useful for the individual teacher, the ICT team and the school as a whole. Teachers should have a huge say into what training they will experience. I've seen instances of where teachers are sent on courses they don't want to attend, and denied permission to go on courses they do. That's a ridiculous way of trying to get the best out of your staff. Admittedly, there may be some things which everyone has to attend, such s information about a new curriculum, but there has to be give and take. As far as what is good for the ICT team is concerned, that should be discussed by the ICT team. As team leader you will need to take some decisions, but they need to take into account your colleaues' concerns and ideas too. Writing a unit of work. Scrutinising students' work (not your own students, someone else's). Spending time in discussion forums, Twitter and so on. Attending training sessions in bite-sized chunks, such as after school, and highly focused, eg Advanced Photoshop or Using Assessment for Learning techniques in ICT. As you don't know what colleagues know or don't know, I'd suggest conducting a survey to find out what sort of things they would like training on. Running a regular ICT surgery. I'll be covering this in more depth soon. Running specific training for teaching assistants who help out in ICT lessons. I've always thought it best for all concerned for them to have at least a basic level of competence in using technology. Encouraging colleagues from other subjects to invite you to their team meetings to help them discover how technology could be used in their lessons. Who is going to deliver the training? It doesn't have to be you or an outside expert. One of your colleagues might be able and willing to do so. I've had pupils giving training, and the teachers loved it because it was so effective for them. Does training always have to take place as an extra-curricular activity? Doesn't that discriminate against colleagues who are paid by the hour? Since the training they enjoy will benefit the school (one hopes), should they not be paid to attend it? Does training always have to take place after school? After all, that discriminates against colleagues with family commitments. How about lunchtime sessions as well? I don't think there is an ideal time for training or a foolproof answer to this type of concern, but I think it's important to try and be as flexible as possible. Does all training have to take place 'live'? If you were to video your training sessions, the recordings could be made available on the school's VLE for colleagues to access in their own time. The same goes for screencasts. Why not create a series of short screencasts to cover the basic aspects of applications which are commonly used in the school? Does training have to take place in school or a teacher development centre? How about a team visit to an exhibition? I have organised some great visits for teachers to work places where technology is used.If such days are planned and organised well, they can be really effective professional development. Does all training or professional development have to be organised? What about taking part in online discussions? What about making the technology available and allowing people to use it how they see fit, or simply to explore it? Looking at your team as a whole (or yourself if you don't have a team), what are your most pressing training needs? Where are the gaps in your knowledge or skill set? How and when can you start to address this? 5 Minute Tip: Keeping a Professional Development Record. Web 2.0 For Rookies: Proving Professional Development. A message from Doug Dickinson reminded me of the OU Vital Community. OU Vital is a recently-established online professional development community for ICT educators. Run as a collaboration between the Open University and e-Skills, it is providing a range of free professional development opportunities, both offline and online. One thing it does which is especially relevant here is provide a range of 15-minute CPD activities -- ideal for the busy teacher (if they happen to be at the right time, of course). Thanks for the reminder, Doug. I also mentioned, in the comments, a forthcomin article about managing meetings. It has now been published here. A task a day for 31 daysIf you lead a team of ed tech teachers, you can do a lot with team meetings; in fact, you can turn (at least some of them) into opportunities for professional development. It's a very good idea to occasionally depart from the standard team meeting format and put on a "special". This helps to keep interest high, and enables various goals to be achieved, including staff professional development, which I discussed in the post about attending conference. They can also help the team to maintain its "edginess" and dynamism. As Doug Woods said in his comment about the post on resources, the most precious resource a school has is its staff. Help them become even better, and in so doing improve the team as a unit. It may be difficult to get someone to come for just an hour. However, if you invite them to spend the afternoon, say, being shown around and taken into some lessons and talking to students, they may be willing to address you and your team afterwards. The benefit for them is that get to see a real school in action, and which prevents them from losing touch quite so rapidly! Alternatively, invite another member of staff or even a student to give a talk on something of relevance. It may be about a generic issue such as assessment or lesson observation, or a more specific one such as how your students use Facebook. If you invite a student to an after-school meeting, make sure you obtain parental permission and check that it's OK with the powers-that-be. Remember: all guests should be offered refreshments. Make team meetings productiveIt helps to prepare for this. For example, ask teachers to come armed with a list of topics that they need resources for, and/or a list of resources they have come across or acquired but have not had time to have a proper look at. There's a rubric I devised which you may find helpful. Also, consider getting in inspection copies of books and demo software to look at. You could also consider combining this idea with the previous one, and invite a product salesperson to come in and give you a demo and answer questions. Yes, they know you and your team and what you do -- but do they? Why not invite them along to look at the kind of activities the students are asked to do, and have a go at some of the whizzier things themselves? Make sure there is student work to look at, and be prepared to discuss examination results and that sort of thing. "Work scrutiny" means going through pupils' books and folders to try and gauge what they have leant and achieved -- in this case in the use of educational technology. It can be very useful if you can, with permission of course, go through the pupils' books from another subject, such as English, although a request to do so could be construed as being some sort of inspection. The purpose of doing work scrutiny is to find out how good a job you've done at getting pupils to use and understand educational technology in general. Read more detail in the post about looking at students' work. This is a variation of inviting a guest speaker. Why not arrange to speak to an ed tech teacher or her students in Canada or the USA, say, via Skype? Obviously, you have to keep an eye on time zones (which is why, being based in the UK, I did not mention Australia or New Zealand). "Moderation" means going through pupils' work and assessing it, in order to make sure that everyone has the same understanding of (a) what the standards are against which you're assessing the work, and (b) how to interpret and apply them. It is not the same as work scrutiny, mentioned earlier. Why not discuss the activities you already do, and see if other ways of achieving the same thing can be thought of? Ideas that sound promising could be put into practice on a limited trial basis -- see the next idea also. For this to work, at least one person has to have done some research of course. It could be classroom-based research. For example, you may have decided to try out one of the ideas generated in the ideas "special" meeting with one class as a pilot study. The outcomes can be discussed here. Or someone might report back on a conference or an exhibition they've attended. Use the time to be shown how to use a particular application, and to practice using it. This can be especially useful if a unit of work is coming up that requires people to have a knowledge of, say, how to use a wiki or desktop publishing. The one thing that teachers always complain they have too little of is time. So make a space for them to create resources. 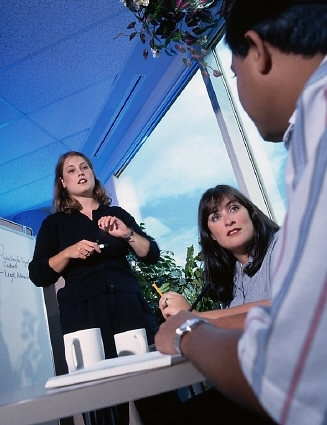 Doing so in the same room as others gives people a chance to bounce ideas off their colleagues. This works especially well if you have asked different members of your team to be responsible for different things. For example, are there changes in the rules about writing school reports? Has anything happened in the edublogosphere that ought to be brought to your colleagues' attention? What courses will you put on next year? What needs to be done for the new course starting in September? What courses do you hope to run, or should you be thinking about running, in 3 years' time? How well are your students doing? How much progress have they made since last year? Are there differences between the attainment of girls and boys? What does your data tell you about these sorts of questions? This is not quite the same as discussing ideas (see above). Having analysed the data, you will probably want to discuss ways in which to improve -- but this can be a stand-alone activity. A very useful starting point is to approach it from the point of view of a student. As a student, how do you know how well you are doing, for instance. In fact, why not ask the students what they think you're doing well, and what needs addressing, with suggestions? Take a look at your handouts or VLE pages for your students. Do they require a higher standard of reading than some of your students possess? What is in place to ensure that students at risk of falling behind get the extra help they require? In fact, going back a step, what is in place to make sure that you find out in advance which students are at risk in that sense? What about students with physical disabilities? Have you catered for them? Use a meeting to discuss these issues and then draw up an action plan to deal with them. If pupils are under-challenged they become bored, and bored children often become disruptive. What extension activities are in place to prevent that happening? Again, use the meeting to identify gaps in the provision for such students, and decide who is going to what about it by when. Do you and your team really need that copy of the version of the National Curriculum that was changed in 2000? It's nice to have an archive of historical material -- but only if you're a museum. I have always found that clearing out a load of obsolete stuff has a really liberating and refreshing effect on the whole team. Is too much money being spent on printing? Are costs in one area significantly greater than in others? What peripherals and consumables need to be bought before the end of this school year, and what needs to be planned for next year? Involving the whole team in such discussions can lead to a greater sense of shared responsibility -- as well as some good money-saving ideas. What equipment needs to bought next year, and what replaced? How about over the next 3 years? You'll need to have your development plan handy for this one. It also ties in with planning professional development (see below). What's going well, and what not so well? Clearly this is related to other suggestions here, such as sharing good practice, but there is a subtle difference in emphasis. To make this work, there has to be an atmosphere of trust: nobody likes to say in public what is not going so well for them. It also ties in with the Niggles and Quick Wins suggestions (see below). If there is a chance to have some team teaching, why not use meeting time to do some joint planning? In fact, even if you are not going to have team teaching, planning lessons together (doing so in pairs works well) can lead to new insights and ideas. It can be a great way to freshen up everyone's teaching. See also the suggestions about creating a lesson plan bank. If you have a chance to observe each other's lessons, the results can be discussed here. With permission, you could video parts of lessons and use the meeting time to watch and then discuss the videos. Alternatively, and perhaps less threatening to people, carry out this exercise using a third party video. For example, Teachers TV lets you download and use video clips. When was the last time your departmental policy on assessment was looked at? Do you have one about accessing the VLE? How about equal opportunities? Obviously, in an ideal world the policies will be lived in practice. Nevertheless, the documentation ought to be reviewed and, if necessary, updated at least once a year. If you think about it, an evaluation by an inspector, who will not have the time to see everything that goes on, can be affected by the sight of a set of policy documents that are clearly 5 years old. Sometimes, the policies themselves are fine in principle, but the terms used have become obsolete. For example, a sentence like "Pupils are not allowed to bring in their own diskettes" looks old even though diskettes are still in use. But changing that to "memory sticks" will only solve the problem temporarily. It may be better to try and future-proof it to some extent by using a general term like "media" instead of a specific one. What sort of things are upsetting people, and how might they be tackled? One of the things that always used to upset me, for example, was teachers leaving the computer room as if it had been hit by an earthquake. Or take the case of a school I visited recently where someone had walked off with a video lead, because it was "stored" on someone's desk. What creative or even very simple solutions could be implemented to deal with such occurrences? See the next suggestion too. In a way, this is similar to #27, but is more outwardly-focused. Walking around the school, what could be done very quickly and inexpensively to make other teachers want to make greater use of the educational technology facilities? Why not ask your colleagues, via a survey, what they like and dislike about the provision, and invite suggestions to improve it? You could then discuss the results at this meeting. What professional development do the team, and its individual members, require? What's coming up in the next year by way of conferences or other events that may be useful to attend? You will need your development plan at this meeting, because it is much easier to get the go-ahead to attend an event if you can demonstrate how it will enable you and your team to meet your objectives. Did you find this list helpful? All feedback greatly appreciated! This is a variation and an update of an article first published on 22 August 2008. A task a day for 31 daysLooking at data is all very well but doesn't tell the whole story. In my opinion you also need to see what goes on in a lesson. This is potentially a sensitive subject: nobody likes to feel they're being monitored. I think it is therefore quite important that everyone in your team, including yourself, has at least one lesson observed. If possible, arrange it internally, that is to say, have members of your team observing each other rather than bring in an outside colleague, unless that is unavoidable. Recording the lesson on video can be useful -- although a pocket camcorder will do!If possible, have the lesson recorded on video. That can obviate the need for any elaborate cover arrangements and has the added advantage that the observer and the observed can look at the lesson together. This is quite useful because, done properly, it leads to a good discussion that can benefit both parties. Indeed, if people are brave enough, and trust each other enough, all such videos can be discussed by everyone in the team on a training day, or as part of a special team meeting (other ideas for team meetings will be covered on another Day). This has to be a matter of mutual agreement to some extent. For example, the person being observed might ask the observer to pay special attention to the way they use the whiteboard. The greater part of the observation has to be on whether or not the students are learning, or learning quickly enough. That means that it's fine, in my book, for the observer to ask students questions in order to ascertain their understanding, as long as, obviously, that they don't disrupt the lesson by doing so. If you're going to assign a grading system to different aspects of the lesson, you will need to ensure that everyone in the team understands and uses the same system in the same way as each other. How well does teaching match individual students’ needs? This is not a definitive list, of course. Obviously, I should not advise trying to observe all of these in a single lesson! As team leader, you are concerned with the quality of the educational technology as a whole, and lesson observations across the board can be really helpful in this regard. You may, for example, pick up on the fact that colleagues don't use the interactive whiteboard much. Is that because they have not received adequate training? Or perhaps the pace tends to be too fast, leaving some students behind. Is that because they're concerned about covering the whole scheme of work in time? If so, does that suggest that the scheme of work is too crowded, or that more teaching time is needed? Perhaps now that you come to look at it, the quality of your accommodation isn't wonderful. Is it possible to make a case for some refurbishment in the next financial year? Of course, the bottom line is that as team leader you need to know what's going on in actual lessons. You can't rely on reports or statistical data. You have to actually see it for yourself. That doesn't have to be done in a draconian way. It doesn't even have to be done too often, especially if you have cultivated an ethos of nobody minding other people wandering into their lessons unannounced. But it does need to be done as it is a good means of finding out useful information and gaining an overview of learning and teaching in your area of the curriculum. If you recall, each Day in the series is intended to include an activity that takes no more than 15 minutes. Clearly, you can't observe everyone's lessons in 15 minutes -- although you may wish to suggest that nobody's lesson is observed for more than 15 or 20 minutes, which makes the process more manageable. You may even wish to focus on the start or end of each lesson rather than all of it. So I suggest that you spend your 15 minutes today reflecting on what's been written here, and perhas drawing up a rudimentary timetable of which lessons could be observed when -- starting with your own. If you manage a large team, including people with more specialised technical expertise than yourself, how do you ensure that your decisions are good ones? Is decision-making an art or a science? I think this is an important question. If you think it's an art, then it is only a short step away from saying "some people have 'it', and others don't." And if you think like that, then it is very hard, perhaps even impossible, to improve your decision-making. So, I come down firmly in the camp that says it's a science. In other words, it can be approached methodically, and the process can be improved. What do we mean by a "good decision"? Some decisions are good in the short term, but not necessarily so in the longer term. Every parent understands this: when your two-year old is throwing a tantrum in the supermarket because she wants some sweets, do you give in for the sake of peace and quiet, or ride it out? The first option is undoubtedly better from a peaceful existence point of view, and to avoid embarrassment, but it's very much a short-term solution. In the long run, the child learns that tantrums work, and so your easy way out will cause more of the same in the future. Furthers the aims of the team in terms of its strategic plan. Does not sacrifice the long-term for the short-term. Included the team, or at least leaves the team feeling that it has been listened to. So, how do you arrive at good decisions? Your decisions can only be as good as the information you have on which to base them. But "good" does not mean "plenty". In fact, the more information you have, the less likely you are to be able to use it effectively. The best thing to do is to ask one of your team to summarise the issues for you. My preference has always been for what I call the "A4 Briefing". I don't care how complex a problem is, it should be explainable in no more than a side of A4 (or Letter if you're in the USA). In fact, one of my bosses insisted on no more than half a dozen bullet points. What I also like is for the person who is summarising the information to outline some options. Nothing too complicated -- that would defeat the object -- but just enough to give me some hooks on which to hang my thought processes. 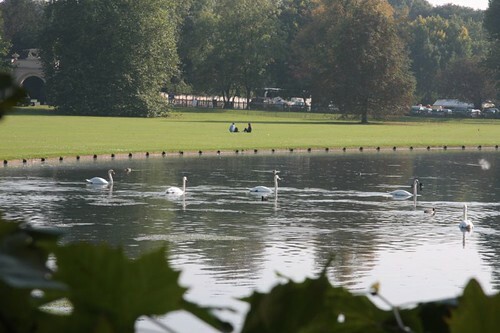 Swans on the lake at Audley End. Watching them can help in your decision-making. I think we have a tendency to hammer away at a problem, but often the best thing to do after some initial thought is to go away from it completely. An afternoon spent by a river, say, can work wonders, because while you're walking, your subconscious is working. Now that's what I call efficiency!